The Rolling Stones will play their final show of the European LICKS Tour tonight at the Letzigrund Stadium in Z�rich, Switzerland. See the IORR Z�rich review pages for the set list and reviews as the show are being performed. The opening act will be the Basel band Lovebugs. Then the Stones will take a break before they finish the tour this year with four shows in China. The Forty Licks tour documentary DVD "Four Flicks" will be out on Nov. 10 in Europe, Nov. 11 in USA and Dec. 10 in Japan. It is including four DVD's with recordings from theatre, arena and stadium shows during the LICKS world tour, plus studio recordings made in Paris 2002, plus a lot of tour documentaries, behind the scenes features and more. See the new IORR Four Flicks pages, being updated as more information is being available. The Rolling Stones surprised the sell-out crowd at their final London show last night at the Twickenham Rugby Ground by playing "Salt Of The Earth". It started with Keith, on acoustic guitar, opening up on vocals, true to the original, and with Mick taking over the vocals on the same microphone up front. Also, Angus and Malcolm of AC/DC joined in for a great version of "Rock Me Baby". A Ronnie Wood specially personalised fridge will be auctioned for the Teenage Cancer Trust at Sotheby's Rock'n'Roll sale on Wednesday September 24 in London. Ronnie�s fridge will be auctioned alongside a painted fridge from ex-Beatle Ringo Starr. �It�s cool to do something original... I�ve never painted a fridge before!�, says Ronnie. See more details and a picture of the Ronnie Wood fridge. The final show of the LICKS TOUR in Europe will be in Z�rich, Switzerland on Thursday Oct. 2. Then the Stones will have a one month break before they move on to Asia, to do the delayed shows there. See the IORR 2003 Tour Dates pages. The Rolling Stones are expected to play in Shanghai, China November 11, on their way from Hong Kong to Beijing. The date is confirmed by the local promoter, but not by the Stones. See the IORR 2003 Asian Tour pages. Johnny Cash died today Friday, following complications from diabetes that resulted in respiratory failure. He was 71. "His influence spread over many generations of different people," said Mick Jagger. "I loved him as singer and a writer." See the Yahoo news. The tickets to the show in Zaragoza, Spain go on sale tomorrow morning Wednesday. See the IORR zaragoza travel pages for details. The Rolling Stones did yet another brilliant arena show with a touch of the stadium set list in Manchester tonight. During the encore Jumping Jack Flash three well organized stage runners hit the stage from front, one was taken down immediately, two were taken down on stage, and a fourth inspired by the first three made an attempt from the side without success. The Stones own security did their job in an excellent way, while the numerous yellow shirted local security people didn't have a clue as to what was going on. There are rumours of a 2nd show in Z�rich on Oct. 5. If the stadium show sell out soon tomorrow morning, then watch out for a 2nd show, arena show that might be. See the IORR 2003 LICKS tour dates. For tickets to the Stones show in Coimbra, Portugal use the phone number +351 707 301 001, or access the Plateia ticket site. For tickets to the show in Benidorm, Spain see the ServiCaixa ticket site. For details of tickets and travel see the IORR 2003 European travel pages for Coimbra and Benidorm. The Rolling Stones are expected to play the 17,000 capacity "Capital Gym" in Beijing, China November 14, following their planned shows in Hong Kong. Also, shows in Shanghai and Bangkok are expected, as these were cancelled due to the SARS outbreak earlier this year. See The Age, BreakingNews.ie and the IORR 2003 Asian Tour pages. The Rolling Stones will return to Asia for more shows later this year, as the promoter in Hong Kong is now confirming their shows on Nov. 7 and 9, at the Hong Kong Harbour Festival. More Asian shows are expected for Shanghai, Beijing and Bangkok. The delayed shows in Asia will probably be the last shows of the LICKS tour, as the rumoured shows in America 2004 don't seem to happen. See news entries by Billboard and Canoe. The LICKS tour started exactly one year ago in Boston USA, as Mick said to the crowd at the 2nd Glasgow show tonight. The crowd was hot, the band was hotter, and Keith kissed Ronnie on his lips as they came down the small stage to do "When The Whip Comes Down". Keith sang the Scottish traditional "You take the High Road, and I'll take the Low Road....", and the entire crowd filled in. It was lots of smiles and rock'n'roll all the way! Also, for the soundcheck, Keith did "You Win Again" twice, but we still have to wait a bit until he does it in front of a crowd. The Rolling Stones played their first of two sell-out shows last night at the smaller 8,200 capacity SECC Arena in Glasgow, Scotland. See reviews and unique video clips of "Street Fighting Man" and "Start Me Up" in the IORR Glasgow Sept. 1 show pages. The rumoured shows in Coimbra, Portugal and Zaragoza, Spain are now confirmed. 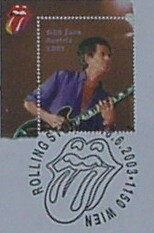 See the IORR 2003 tour dates pages and RollingStones.com. For travel info see the IORR 2003 tour travel pages. The Wembley Sept. 14 show is now rescheduled to Saturday Sept. 13, while the Benidorm show is rescheduled again, now from Sept. 18 to Thursday Sept. 25, to match the tour logistics in Spain/Portugal. See the IORR 2003 tour dates pages and RollingStones.com. The local promoter "Ritmos & Blues" will probably announce the Stones show in Coimbra, Portugal for Sept. 27 tomorrow, and the show in Zaragoza, Spain two days later is also due to be annonuced any day now. The rumoured show in Zurich is still not ready, and the Belgrade rumour is probably false. See the IORR 2003 tour dates pages. The new book "According to the Rolling Stones" edited by Dora Loewenstein and Philip Dodd, published by Weidenfeld & Nicholson, priced at 30 pounds (45 Euro), has been on sale for a couple of weeks now, also at the official merchandise stands of the Stones, at the shows. See the book review in The Guardian. It's a great book. Get it if you can! The Rolling Stones are offered 5 million US dollars to play two shows in Hong Kong, China on Nov. 8 and 9. This bid is partly funded by government money to recover the Hong Kong economy from the SARS outbreak this spring, and it is competing with another promoter bid for a show at the Hong Kong stadium on November 8. See AFP/Yahoo. The planned shows in Belgrade and Zagreb never made it this summer, but now the rumours in Yugoslavia is telling about a probable show in Belgrade on Oct. 5. This show date is also mentioned for the show in Zurich, Switzerland. May be this is the last date of the European tour this summer. See the IORR 2003 tour dates pages. The rumoured Stones show in Zaragoza, Spain on Sept. 29 will be announced officially on Monday or Tuesday next week, according to Heraldo de Arag�n of Zaragoza. Ticket prices will be 50-120 Euro. The Rolling Stones are adding another three weeks of shows to their LICKS Tour of Europe this fall, as they are re-scheduling shows for Benidorm, London and Amsterdam, and also adding more shows in Spain, Portugal and Switzerland. AFP is claiming the last show in Europe will be in Portugal, Sept. 27, but that might not be true, as they are also talking about shows in Zaragoza, Spain on Sept. 29, and Zurich, Switzerland on Oct. 2. See El Periodico de Aragon and Publico.com. Also see confirmed and rumoured show dates in the IORR 2003 tour dates pages. The Rolling Stones had troubles starting up their tour in London six days ago, as they had to cancel their first of two Twickenham shows, but after that they did a perfect trilogy of shows in London, stadium, theatre and arena, finishing off last night at Wembley Arena. See reviews and setlists from the London shows at the Twickenham, Astoria and Wembley Arena. And for September, they will back for three more shows in London, see the IORR 2003 tour dates. Mick was "back in business" last night at the Rolling Stones first UK show in Twickenham, Great Britain, with no signs of voice problems. And as the Amsterdam Arena show on Aug. 20, originally planned for use in the DVD production, got cancelled, they did a full scale audio and visual recording of the Twickenham show last night. The home coming is now on tape! There are rumours about late September shows in Portugal, Switzerland, and also in Zaragoza/Spain. These shows will have to fit into the schedule of the postponed shows in September. All late September dates may still be changed, including the resheduled Benidorm show. See the updated IORR 2003 Tour Dates pages. The Rolling Stones show at Twickenham tomorrow Aug. 23 has been postponed, due to Mick having got the flu. A new date is temporarily set for Saturday Sept. 20, but it needs to be be confirmed by Twickenham authorities, granting a license to play on this new date. For details see the press release on RollingStones.com. For hour by hour updates and info from fans to fans see the IORR Tell Me pages. The Rolling Stones show at the Amsterdam ArenA tonight has been postponed, due to Mick having a sore throat. A new date is temporarily set for Monday Sept. 22, but this date is still not confirmed. See press release by the Dutch tour organizer MOJO, where Mick is quoted: "We are sorry to disappoint the fans who were planning to come to tonight�s show. We will be back in September to do the gig and will give you a Stones show you�ll never forget!" "I will be suitably recharged, recovered and fit for Saturday's kick-off of the UK dates at Twickenham stadium, in our home town," Mick added. Also, see the official statement by The Rolling Stones. The show at the Amsterdam Arena last night had all the cameras in place for the broadcast and DVD recording set for the 2nd show today. During "Slipping Away" Keith was filmed, one camera non-stop, with a mobile camera on-stage, handled by a crew of three, all over Keith, 360 degrees, to bring you up stage in unique positions for this song. The Getty Images Gallery in London will exibit exclusive 1975 Tour Of The Americas (a.k.a. TOTA) photos by Christopher Sykes, in cooperation with GQ Magazine, from Aug. 30 to Oct. 25. Also, the GQ Magazine September 2003 issue is having a 10 pages exclusive photo report from this exhibition, plus 4 pages Keith interview with photos. See the special IORR page on the Christopher Sykes exhibition, also with many sample images. The Rolling Stones are teaming up with Listen.com's Rhapsody online music service to make their songs -- from both the ABKCO and post-ABKCO eras -- available for digital download for the first time. Details will be officially announced on Monday. Keith said it was a "good room", and also he said he would like to wrap it up and take it with him, as the Rolling Stones played the Vredenburg theatre show in Utrecht last night. This was show number four in The Netherlands, following the shows in De Kuip on Aug. 11 and Aug. 13, and at the Ahoy on Friday. Still two more shows to go at Amsterdam Arena for the Dutch fans. And selected songs of the Vredenburg show were filmed and recorded, to be used in the DVD to be released in November. IPC Media have made a special NME Originals magazine in UK, featuring reprints from NME 60's versions, lots of great pictures, historic articles, news stories, live reports, record reviews and interviews just as they appeared week by week back in the 60's. It's available in stores as well as by mail. Also, this week's edition of the NME magazine is a Keith cover special with interviews. See NME.com. The Vue will warm up for the Stones at the Vredenburg club show in Utrecht, Netherlands on Saturday Aug. 16. For UK there will be the following warm up acts: Twickenham: Starsailor; Astoria: The Thrills; Wembley Arena Aug. 29: Feeder; Glasgow: Idlewind; Manchester: Tim Burgess. See the complete list of warmup acts in the IORR 2003 tour dates pages. Swedish television SVT 1 will broadcast three different Stones programs this month. On August 17 they will show "Bill Wymans bluesresa" part 1 of 2. On August 19 they will air a documentary about the triple shows in Munich earlier this year, and on August 23 they will show the complete Amesterdam Arena show from August 20. 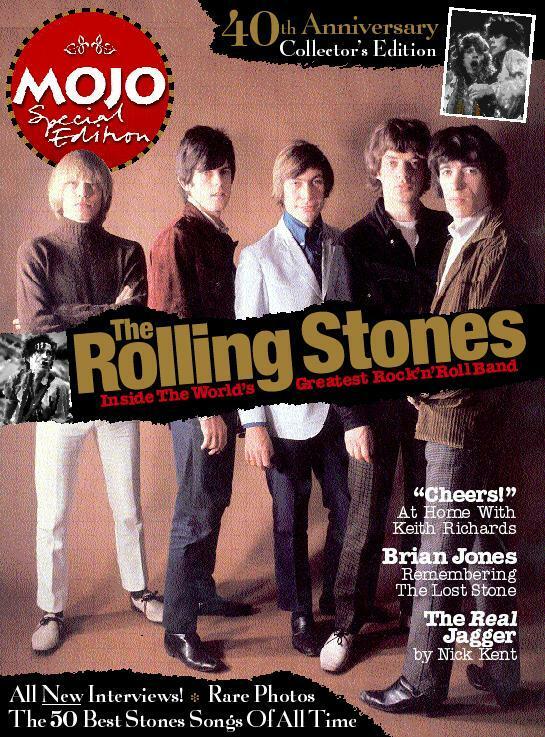 To celebrate The Rolling Stones LICKS Tour coming to UK later this month, the UK magazine Mojo presents a 148-page, full-colour, special collector's edition devoted to The Stones. Many pictures of course, plus new interviews with Mick, Keith, Charlie and Ronnie. The special is on sale from August 26 in stores and by mail. See how to get the magazine, and see how the front page looks like. The Rolling Stones played the first of six shows in The Netherlands tonight at the Feyenoord Stadium, and surprise songs were "Paint It Black" and "Star Star". More surprises are expected, as they play back to back shows in Rotterdam and Amsterdam, plus a club show in Utrecht. See the set list and review from the first show at De Kuip in Rotterdam. The postponed Rolling Stones show in Benidorm, Spain has been re-scheduled to be played on Thursday Sept. 18. This is so far the last show of the European LICKS tour 2003. See Pollstar. The Rolling Stones show tonight in Benidorm, Spain has been postponed, due to illness, as Mick has got laryngitis (sore throat). They will try to re-schedule the Benidorm show to a later date on this tour, if possible. The Hannover show on Friday is still on, pending on Mick's condition on show day. See news entry in El Mundo, also talking about a temporarily, unconfirmed new date. The Rolling Stones were top of the bill at a show in Toronto, Canada last night which is breaking every record as the biggest selling rock show ever, with a record paying crowd of 450,000 people. And as the Stones flew in for this one show only in Toronto in the middle of their European LICKS tour, they were given the keys to the city of Toronto. See the reviews and comments from the Toronto show. The Rolling Stones are planning to return to Honk Kong on either November 8 or 15, to play at the 45,000 capacity Hong Kong Stadium, according to Sunday Morning Post. Once they go back to Asia in November, they are expected to play Beijing, Shanghai, Bangkok and probably a few other Asian cities as well. The new Rolling Stones DVD is scheduled to be released in November this year. It is planned to be a 4 DVD with live material from Madison Square Garden Jan. 18 (arena), Olympia Paris July 11 (club) and Amsterdam ArenA Aug. 20 (stadium). Plus there will be a separate documentary DVD featuring interviews, off-stage recordings etc. July 26: Happy birthday Mick! Happy birthday to Mick Jagger turning 60 today, said to be celebrating his birthday in Prague. The IORR European Tour 2003 travel pages have been updated for Prague, Werchter, Rotterdam, Amsterdam, Glasgow and Dublin. Still needing info for Manchester. If you sent travel info or reviews and it did not get published, or if you have more info for these pages, then please send it once more by e-mail to [email protected]. The Swedish press followed every step the Stones took during their week in Stockholm; usually 4-6 pages in every paper every day, lots of photos. And the stadium, arena and club shows at Stockholms Stadion, Globen and Cirkus were just excellent, getting five star ratings, with characteristics like "An Immortal" and "Classic" show. Also, the fans do agree, as seen from the reports. A series of remixes of "Sympathy for the Devil" will be released for radio playing on Monday, ahead of public single release on Sept. 1. The new mixes, commissioned by ABKCO and distributed by Mercury/Universal, are by the Neptunes, Fatboy Slim and Full Phatt. All are in radio-edit and full-length versions. A video for one of the mixes will incorporate material from Jean-Luc Godard's film "One Plus One," which features the Stones playing the original "Sympathy" at London's Olympic Studio. Mick Taylor will be performin at the 100 Club in London, UK on August 28, the day off for the Stones between the shows at the Astoria and Wembley Arena. Tickets are on sale through Wayahead.com. The final Rolling Stones show in Amsterdam ArenA, Holland on August 20 will be broadcasted live on Dutch radio 2 and also on the Dutch commercial TV station RTL4. The concert is sponsored by the "Staatsloterij", a major Dutch lottery who will be doing the drawings of the lottery numbers during the concert broadcast. See more info on the special Stones pages of Radio 2. Danish press is bringing six star reviews and superlatives like "best show in Denmark ever", "genious", "fantastic", "the man on the (full) moon was singing along on Gimme Shelter" and so on, as the Stones indeed played a fantastic stadium show in Denmark last night in front of 47,000 fans. See the IORR Copenhagen show pages for press links and reviews. Mojo, the UK monthly music magazine, is asking fans to submit their 10 favourite songs for a forthcoming poll to discover The 50 Best Rolling Stones Songs Of All Time. Please e-mail your entries to [email protected]. The results will be published in a special issue of the magazine completely devoted to The Rolling Stones, due out for the UK shows in August. The new It's Only Rock'n Roll magazine issue IORR 48 was mailed out to all fan club members last week, and should have arrived to each and every one of you by now, wherever you live in the world. The magazine is showing the best and greatest tour photos, show reviews, song by song matrixes, news and more, specially dedicated to the 12 European shows in June. For information about how to subscribe see the Get IORR pages. The Rolling Stones show in Toronto, Canada on July 30 has so far sold 475,000 tickets at CAN $21.50 each. This will be one of the biggest paying rock crowds ever - even Hyde Park, Altamont and Knebworth will be small compared to "The Stones in Toronto 2003". And 50,000 of these tickets are sold to U.S. fans going to Canada... Other bands on the bill are now: AC/DC, The Guess Who, Rush, Sam Roberts, The Flaming Lips, The Isley Brothers, Kathleen Edwards, Justin Timberlake and Sass Jordan. See Canoe. The Rolling Stones are in the middle of their four shows French tour, having just played Marseille and the first of three Paris shows at the Bercy. Now their stadium show tonight at the Stade de France has been threatened by a French arts workers' strike. Still, the road crew is doing their job, the stage is being built, and Jackie Lombard, who is in charge of the French tour, said Wednesday's show "will go ahead whatever". Same with the club show at the Olympia on Friday. See the BBC news. The Rolling Stones played the last out of three Spanish shows in five days in Barcelona last night, with shows in Bilbao and Madrid earlier in the week. A total of 150,000 Spanish fans made three excelellent shows, and still Spain has got one more show to go on August 5 in Benidorm. Now the Stones have the following week off touring before they continue the tour in Marseille, France on Saturday July 5. The Rolling Stones are today confirming they will play at a large outdoor show in Toronto, Canada on Wed. July 30. Other performers at the show are The Guess Who, AC/DC and Justin Timberlake. Tickets will cost $16. Mayor Mel Lastman said in announcing the concert. "The people here know Toronto is a safe city. After the Stones play here, the entire world will know it." See RollingStones.com and Associated Press. The Rolling Stones have recorded a media promotion video tape to be broadcasted during a press conference next week, probably on Tuesday morning June 24 (afternoon European time) at Yonge-Dundas Square. In this tape they are confirming they will play a show in Toronto, Canada on July 30. It is said the concert will take place on the city's docklands, so the downtown skyline will be visible behind the stage. See news reports in Canadian media: Toronto Star, Pulse24 and Canoe. The Frankfurt/Mannheim area in Germany is ready for yet another field show with the Stones, this time at the Hockenheimring Formula-1 racetrack. See the stage being built for the Hockenheim show tomorrow. The Beck's beer trucks are ready, the main stage and B-stage is there, and 60,000 fans will show up there tomorrow to see The Pretenders (17:15), AC/DC (18:30) and The Rolling Stones (20:30), with expected performances starting at the given times. The Leipzig fans got two guest appearances with the Stones tonight at the Festwiese show, as Angus and Malcolm Young from AC/DC joined in on a terrific club style version of Rock Me Baby, then Crissie Hynde from The Pretenders paired with both Mick and Keith for a great version of Honky Tonk Women. 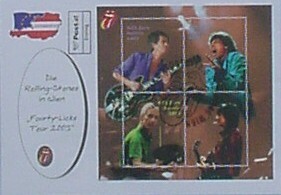 The special Stones stamps were released in Vienna, Austria today, in time for the show at the Ernst Happel Stadum tonight. For stamp collectors there are two official First Day Covers (FDC's), one with the Austrian map, another one with the pictures, and of course a special event stamp with the Stones tongue. According to GoForMusic the reason for the change in the Werchter date from Aug. 2 into Sept. 7 was the fact that the Stones will play in Toronto, Canada on July 30. So the Toronto show is now probably a done deal, also according to canoe Online Canada. The Rolling Stones are making all the Belgian fans happy now, as they finally decided to play at the TW Classic Werchter Festival outside Brussels on Sept. 7. The Rolling Stones are the top act in this one day festival, with the three other bands "Therapy? ", "De Mens" and "Clouseau". Tickets are on sale now. See GoForMusic and TW Classic for details. The 3rd Rolling Stones show at the Wembley Arena this year is confirmed for Sept. 15 and on sale now through Ticketmaster UK. The Rolling Stones returned to Milan, Italy for the first time in 13 years, and the Italian fans got a touch of the Bridges To Babylon tour tonight, as they played Out Of Control for the first time during the Licks tour. It was a large and great crowd, and the Italian fans have now proved they have to get the Stones back for every future tour. See the IORR Milan pages for the set list and reviews. The Rolling Stones finished their trilogy of shows in Munich last night in front of 2,400 lucky fans at the Circus Krone Bau. Charlie spoke a few words in Mick's microphone, Keith did a touching version of "The Nearness Of You", and Mick gave the fans an unique falsetto sitting by keyboards doing "Worried About You". And with a never ending ever rocking crowd pleasing encore in "I Can't Turn You Loose", this was just a show the fans will talk about for a long, long time, still not forgetting the arena and stadium shows that made this a real complete unique Stones trilogy in Munich. Even if it sounds like a wild rumour, the Stones playing Toronto, Canada on July 30, between the Prague show on July 27 and another rumoured show in Werchter, Belgium on Aug. 2 is still on as a rumour. The following week will tell us if they manage to seal the deal. See Canoe Online. The Rolling Stones invited European press to a press conference in Munich this afternoon. The opening question: "We are amazed by your level of energy. How do you do it?" Keith replied, as several times later on: "It's a secret!". Mick added some more facts of course. Charlie said nothing as usual, and they all seemed to have great fun. See the full report and pictures from the Munich press conference. The Rolling Stones are receiving excellent reviews from reporters in European press, following their show last night. See links to lots of great news reports, plus reviews and more in the IORR Olympiahalle July 4 pages. Also, soon to follow - reports and pictures from the press conference in Munich this afternoon. The Rolling Stones are working on a new studio album while touring in Europe this summer. In-between the shows and the tour rehearsals they will try out and finish the new songs, some already done in Paris last year, during the Forty Licks recordings, others to be finished on tour. Also, there are rumours of a new DVD with live material from club, arena and stadium shows, plus documentary material. The release schedule is still not known, as this is all unofficial. 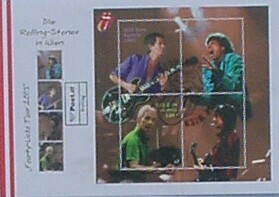 The Rolling Stones started their European Tour 2003 in Munich, Germany tonight at the Olympiahalle. Some 11,000 fans got a set of "Let It Bleed" songs, plus "Heartbreaker" and lots more. Two more shows will be played in Munich at the Olympic Stadium on Friday and at the club Circus Krone on Sunday. For the IORR news earlier this year please see the Jan. - May 2003 news pages. For the magazine stories and photos see the IORR magazine file.